A red ID card wallet in flexible plastic. 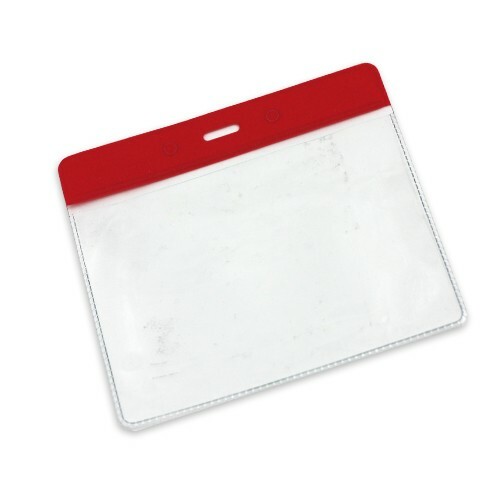 With a red header strip and space to fit a standard size ID card. Typically issued to visitors to your premises along with a visitor pass or ID card. A lanyard can be attached as the wallet has a small hole top centre. This red ID card wallet is made from flexible, soft 190 micron plastic with red header strip for displaying standard, landscape format ID cards at a maximum size of 54mm (h) x 86mm (w). The wallet has a convenient space to attach metal clips or lanyards. View our range of ID card wallets.